Destinations Covered : Delhi – Mandawa – Bikaner – Jaisalmer – Jodhpur – Mandore – Udaipur – Bundi – Jaipur – Agra – Delhi. Fly to the busy city “Delhi”, which is also the capital of India. Upon arrival our representative shall meet you at the Delhi airport and accompany you to the hotel. Delhi has many interesting places on offer for its visitors, with a great blend of both historical monuments and British structures along with modern buildings. Rest of the day is at leisure. Overnight stay is in Delhi. Have a very hearty breakfast at the hotel and begin this day of your Imperial Rajasthan Tour with a full day sightseeing tour of the capital of India – Delhi. During your sightseeing Humayun Tomb Delhitour of Delhi you will observe the various shades of ancient and modern Delhi. Some major attraction of the capital of India are the Laxmi Narayan Temple, India Gate – the war memorial dedicated to martyrs who laid their live for the sake of the country, Parliament House – the government headquarters, Lotus Temple – the only Bahai Temple, Humayun’s Tomb – built in mid 16th century and an early fine example of Mughal architecture, Qutub Minar, Jama Masjid – the largest mosque in Asia, Red Fort – the red stone magic and Gandhi Memorial – the memorial of the father of the nation. Also enjoy sound & light show at Red Fort in evening. Overnight stay will be at the hotel. After healthy breakfast leave for Mandawa, Rajasthan. It is situated in the centre of Shekhawati district of northwest of Rajasthan. Mandawa is painted domed gateway decorated with Lord Krishna and his cows leeds to the bazaar. Upon arrival check into hotel in Mandawa. 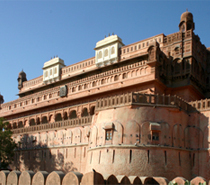 Later head to city tour of Mandawa as a part of Imperial Rajasthan Tour, visit to Mandawa Fort. It has now been converted into a hotel; Mandawa Castle is a 245 years old fortress that has been curved by the family into a fine example of cultural hospitality. Later visit to the Mukundgarh Fort – which has also been converted into a heritage hotel of Mandawa in Shekhawati region. Overnight in Mandawa. Today after healthy breakfast leave for Golden sand city of Jaisalmer, which truly is a breathtaking place with its exceptional beauty of desert. Jaisalmer comprises of several forts and havelis to intrigue its visitors. On arrival check in at the hotel and evening is free to relax after a long drive. Overnight stay is at Jaisalmer. Begin the day with a full day city tour of Jaisalmer. The golden city of the desert is a picturesque city emerging out of the Great Indian Desert – the Thar Desert. Jaisalmer is known as the last settlement in one of the outermost parts of India. The city has retained its old charm till date and attracts tourists from far and near Desert jaisalmerwith its barrel-bellied towers still commanding attention. Some of the prime attractions in the golden city of desert are Sonar Kila – the Golden Fort, Salim Singh Ki Haveli, Manak Chowk, Patwon Ki Haveli, Nathmaji Ki Haveli, Gadisar Lake, Jain Temples, Gyan Bhandar Library and many others. After exploring the picturesque sights, return to the hotel for overnight stay. A lavish breakfast and after that leave for Jodhpur well known for its impressive forts and palaces, this huge town is generally known as the “Blue City” because most of the houses are painted by blue color here and if you will have a view of city from the top of the fort then you then you see the blue city. 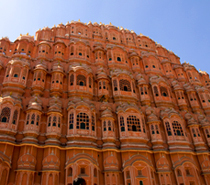 This is second major city in the state of Rajasthan and one of the most important tourist places in the country. The gateway to the vast Thar Desert, Jodhpur is crowned by the enormous Mehrangarh fort which is the main attraction of the city. The magnetisms of the city are the magnificent Umaid Bhawan Palace and the Jaswant Thada – a building of white marble built on the right of fort. On arrival check in at the hotel and evening is free at leisure. Overnight stay is in Jodhpur. Today after healthy breakfast excursion tour to Mandore – Mandore with its turbulent past and attractive structural designs is one of the most enthralling visitor attractions of Rajasthan. It was the capital of the brave Rathores before Rao Jodha recognized Jodhpur. In the afternoon, explore the narrow, busy streets and bazaars of the old city and enjoy its unique attraction. After exploring Mandore, drive back to Jodhpur to explore the blue city visiting Mehrangarh Fort and Jaswant Thada. Overnight stay is at Jodhpur. After healthy breakfast drive to Udaipur enroute visiting famed temples of Ranakpur, which is the most dramatic and vital Jain temples. After visiting temple leave for the city of lakes called “Udaipur” – also known as ‘City of Dreams’ or ‘Venice of the East’- it is the most attractive city in India. An idealistic compilation of exotic gardens filled with rising trees and fancy island palaces sparkling in mirror-calm lakes – that’s Udaipur. The city was established by Maharaja Udai Singh, who turned the Mewar capital here following the third and final sack of Chittor in 1567. 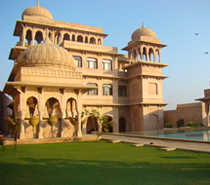 Upon arrival check in the hotel and overnight stay will be at Udaipur. Udai VilasToday have breakfast at hotel and head for city tour of Udaipur visiting the main tourist attractions such as the wonderful City Palace & its museum, Sahelion-ki-Bari, Lake Palace, Jaisamand Lake, Fatehsagar Lake, Gulab Bagh and the Jagmandir. After exploring the romantic city enjoy the boat ride on Lake Pichola, later drive back to hotel for overnight stay. Overnight in Udaipur. After having breakfast leave for Bundi – The small, rural city of Bundi was the capital of last princely state of Rajasthan. It is famous for its palaces, forts, baolis (step wells) and water tanks. 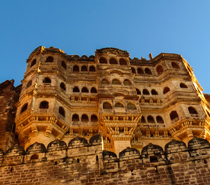 The monuments and their structural design imitate the splendor of the local Rajput’s chiefs. The ramparts of the palaces at Bundi are festooned with life-size frescoes showing the glory of its rulers. Upon arrival check into your pre booked hotel. Rest of the day is free at leisure. Overnight stay is in Bundi. After breakfast head to Amber Fort – Amber was the antique capital of the state. Now an abandoned complex and one of the best hilltop forts in the country, Amber is something which no traveler can afford to give a miss. It is a magnificent for complex with number of attractive palaces, halls and temple in it such as Diwan-i-Am, Diwan-i-Khas, Jai Mandir, Ganesh Pol, and many more. Due to its location at a height an exciting elephant back ride takes its visitors to its entrance making the whole experience more enjoyable. After Amber visit we drive back to Jaipur to visit the popular monuments there which include City Palace & Museum, Jantar Mantar – the Observatory, Hawa Mahal and magnetic bazaars of Jaipur. Overnight stay is in Jaipur. After having breakfast leave for Agra – today Agra is a busy city and some of the Mughal buildings are forever marked. Other monument, however, are scattered like pearls in ashes, suggesting the magnificent period in Indian past when Agra was the centre of the Mughal Empire, and the territory itself was the hub of political, cultural, and creative development. After wash & change head to guided city tour of Agra visiting Taj Mahal explained as “a teardrop on the face of perpetuity is certainly the apex of Mughal structural design. Shah Jahan made this monument in the loving memory of his wife Empress “Mumtaz Mahal”. Also visit Agra Fort – explained as walled splendid city built in 1566 to study the progress of Mughal structural design from red stones to white Marbles. Evening visit Itmad-Ud-Daulah Tomb also known as “Baby Taj” is the pure white & richly imprinted tomb made by Noor Jahan, queen of Jahangir in the memories of her father. Overnight stay is in Agra.